What Makes a Great Hymn? What makes a hymn "good"? Is it good because we like it, because it is familiar, because it brings back pleasant memories of loved ones or special events or times? These feelings and associations are certainly very real to all of us, but they are subjective. 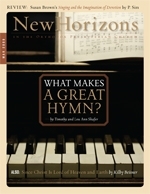 Are there objective standards that we can use to evaluate hymns? It was Friday nightI remember it like yesterdayand we were gathered in our living room for Bible study. Usually we would begin with a prayer and a few hymns, and then my dad would open the Word, perhaps read a commentary, and teach. Then another hymn would close our time before all of us flocked to the goodies in the kitchen. My sister played the piano to accompany us, and whoever was quick enough would choose the hymns we sang. How many times have you heard this comment: "The community church down the road seems so happy and joyous, whereas your church seems so serious and somber"? Many Orthodox Presbyterians have heard such commentscomments that address the "personality" of a given congregation.